Fiesta de Reyes is home to two outstanding Mexican restaurants — Casa de Reyes and Barra Barra Saloon — and is the sister property to a third, The Cosmopolitan Hotel and Restaurant. But it is so much more than a simple cluster of restaurants. The Fiesta de Reyes stage provides daily musical entertainment that draws visitors from around the world and provides premium music to accompany the dining experience. Diners often find themselves attracted to the dance floor as they wait for their meal to arrive or when the last churro is gone. As if that’s not enough, 19 boutique shops surround the Fiesta de Reyes plaza so, if you need a quick gift for the birthday dinner you’re attending, we have you covered. During the day, diners can experience the lush garden setting surrounded by succulents and native trees and plants along with richly painted artwork throughout the plaza. At night, the place literally bursts into flame with three firepits, a myriad of torches and dramatic heaters in the restaurants to ward off the cooler evening air. Both Barra Barra Saloon and Casa de Reyes have opportunities for indoor dining, but this is San Diego and most folks prefer to dine outside and take advantage of its greatest asset, the year-round mild weather. Casa de Reyes is nestled in the heart of the Fiesta de Reyes plaza with both outdoor and indoor dining settings surrounded by lush gardens, boutique specialty shops and vibrant artwork. Most patrons prefer to dine al fresco under the dramatic carrizo arbor. Casa de Reyes fare tends toward traditional Mexican comfort food but with a flair that elevates each dish above the usual Mexican restaurant offerings. Rich sauces, fresh ingredients and perfectly balanced spices make Casa de Reyes a favorite with visitors and locals alike. The menu includes a wide range of options for vegetarians, vegans and those wishing to eliminate gluten from their diet. Every town has a watering hole. It’s the place you can go after a hard day’s work or play to let your hair down and put your feet up. That’s Barra Barra Saloon for Old Town San Diego. Barra Barra takes it a step further by adding exceptional food and dining to the mix. Barra Barra’s menu is centered on Californio Mex fare with dishes from rich seafoods to mouthwatering Mexican barbecues to Indian flatbread tacos that are without equal. This is the corner bar in Old Town, so come on in and be neighborly. Oh. Got kids? Bring them along. They eat free every day of the week as long as they have a matching adult. Here is more on Barra Barra Saloon (including the menu and Tequila list). 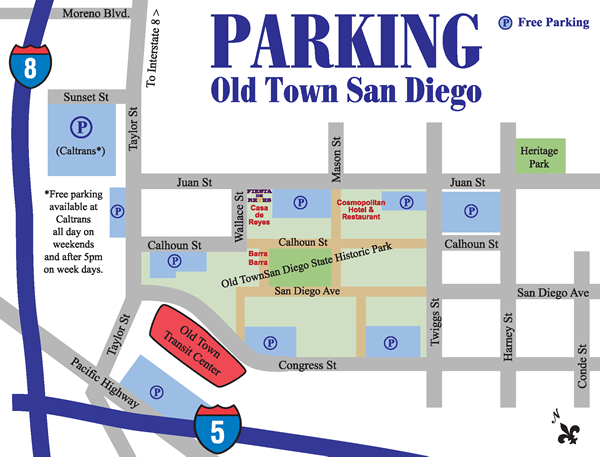 There is no other building in Old Town San Diego State Historic Park that more clearly symbolizes the transition of San Diego from a Mexican pueblo into an American city. The lower floor of The Cosmopolitan was built of adobe by Juan Bandini, a wealthy Californio, in 1827 as a family home. The upper story was added in 1869 by Albert Seeley as a hotel for weary travelers on Seeley’s stagecoach line between San Diego and Los Angeles. The building has been meticulously restored to its original 1870s glory and is now, once again, home to a boutique hotel and a lively restaurant. Dine outdoors on the orchard patio or indoors in the Grand Sala, scene of many an elegant party attended by some of San Diego’s most notable early characters. For more information about the Cosmopolitan including menus and hotel info, Click Here.